Tumor necrosis factor (TNF) is a proinflammatory cytokine and a B-cell growth factor. It has numerous possible effects on T lymphocytes and dendritic cells, and it influences apoptosis. These differential effects may in part explain why patients under TNF-blocker therapy can develop autoantibodies to nuclear antigens, and may shed some light on the finding that low TNF fosters autoimmune disease in some mouse strains. On the contrary, TNF is increased in the blood and in the inflamed kidneys of systemic lupus erythematosus patients. Several studies in lupus-prone mice other than the F1 generation of New Zealand Black mice crossed with New Zealand White mice suggest that TNF is highly proinflammatory in the efferent limb and is potentially detrimental in lupus organ disease. Therefore, TNF blockade probably constitutes an efficacious therapeutic option. Serum tumor necrosis factor (TNF) levels in human systemic lupus erythematosus (SLE) are increased [1–4]. In spite of likewise increased soluble TNF receptors (TNF-R1 and TNF-R2), this increased TNF is bioactive . While these findings could open the door for TNF-blocking therapy, TNF exerts several different effects and TNF blockade may have a variety of consequences. There are two main reasons for some concern about using TNF blocking therapies in SLE patients. First, patients with either rheumatoid arthritis or Crohn's disease sometimes develop antinuclear antibodies and IgM antibodies to double-stranded DNA in the course of TNF-blocking therapies [6–8]. These patients only rarely develop a lupus-like syndrome, however, and both clinical symptoms and autoantibodies disappear when anti-TNF treatment is stopped in such patients [6, 7]. Nevertheless, the propensity to induce pathogenic antibodies to nuclear antigens could constitute a serious problem in SLE. The second reason for concern is that the F1 generation of New Zealand Black mice with New Zealand White (NZB/W) mice not only develops autoantibodies and a lupus-like disease, but also has a clearly diminished production of TNF . In concordance with this observation, New Zealand Black mice, which suffer from mild lupus, also develop severe disease when rendered deficient in TNF . Furthermore, therapeutic application of TNF in NZB/W mice showed significant benefit: high-dose TNF given early in life delayed the development of autoantibodies and lupus nephritis [9, 11]. A deficiency of TNF thus apparently fosters autoimmunity and disease in these mice, but it is unclear how this relates to human disease  and to other murine models of SLE with higher TNF production. 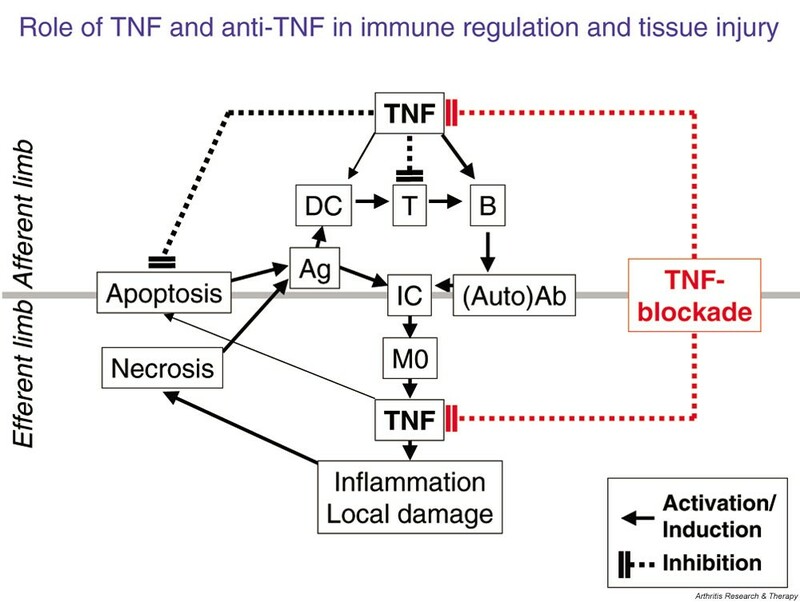 The numerous possible roles of TNF in autoimmunity are somewhat difficult to define not only by virtue of the multiple biological effects of TNF, but also due to different effects in different models and under different settings. However, although it is undisputed that this cytokine is importantly involved in the context of autoimmunity, TNF may indeed play more than one role [13–17]. In fact, many functions of TNF are well defined, and we shall try to discuss the different possible effects that TNF may have on the pathogenesis of SLE. Both membrane-bound TNF and secreted TNF are important in the development of secondary lymphoid organ structures, such as in lymph nodes, in the spleen and in Peyer's patches. Deficiency of TNF results in the absence of germinal centers and in the absence of follicular dendritic cells. In particular, TNF cooperates with lymphotoxin in secondary lymphoid tissue development and also mediates signals for primary B-cell follicle generation [18–20]. While membrane-bound TNF confers the major structure of secondary lymphoid organs, soluble TNF appears to be involved in the generation of primary B-cell follicles . Low levels of TNF may thus be associated with aberrant B-cell responses . Furthermore, TNF influences T-cell receptor signaling, and TNF deficiency could also contribute to aberrant immune reactivities through this additional pathway early on in development and/or in the course of disease induction . The level of TNF expression both in its membrane-associated form as well as in its soluble form thus contributes importantly to the development of T cells, of B cells and of dendritic cells (see later), and to the interactions between these cells, and it may constitute one important determinant of the type and level of immune responses. TNF exerts a wide variety of relevant immunoregulatory functions on a variety of cells of the innate and adaptive immune system. TNF is a growth factor for B lymphocytes, and B lymphocytes are able to produce significant amounts of TNF in an autocrine loop [24–26]. It is of interest that this autocrine TNF production is induced by ligation of CD40, a possible therapeutic target in SLE [27–29], and is prevented by cyclosporin A, another therapeutic agent for SLE . Moreover, stimulation of murine lupus (MRL/lpr) B cells by membrane-bound TNF via their TNF-R2 provides a signal that overcomes the lack of CD40 ligand (CD154) otherwise necessary for the production of (auto)antibodies . TNF may also exert a significant influence on B cells by virtue of its capacity to induce IL-6 . The effects of IL-6 on multiple aspects of B-cell development and activation as well as on SLE have been well established . IL-6 may also affect B cells via T helper type 1 and T helper type 2 cells, the differentiation of which IL-6 is also able to influence . The potential of TNF to modify T-cell receptor signaling has already been briefly mentioned. Interestingly, short-term stimulation of activated T lymphocytes with TNF results in further activation and proliferation [35–37]. Moreover, TNF stimulation leads to increased production of IFN-γ , a cytokine with a clear-cut pathological role in SLE [38–40]. In addition, chronic TNF exposure induces a reversible loss of the surface T-cell receptor complex, and thus T-cell hyporesponsiveness [41, 42], but still allows for IL-2-mediated proliferation. Since similar effects in rheumatoid arthritis patients are readily reversed by anti-TNF therapy , this normalization of T-cell hyporesponsiveness in patients treated with TNF-blocking agents may also influence the induction of autoantibodies. TNF also constitutes an activating cytokine and a maturation factor of dendritic cells, which are essential in immune regulation  and have also been implicated in autoimmunity in general, and SLE in particular [44, 45]. The numbers of both myeloid and plasmacytoid dendritic cells are reduced in the peripheral blood of SLE patients [46, 47]. These dendritic cell counts (or numbers) negatively correlate with the patients' soluble TNF-R2 levels , which in turn correlate with TNF levels . These findings together suggest that dendritic cells have been matured by TNF and hence are found in lymphoid organs rather than in the peripheral blood. On the contrary, IFN-α produced by lymphoid dendritic cells is another important maturation factor for dendritic cells and is thought to be involved in SLE pathogenesis . However, TNF is able to inhibit the production of IFN-α . It is interesting that aged NZB/W mice behave differently, in that they have increased numbers of circulating dendritic cells that can be matured by TNF . This is probably due to the decreased systemic TNF production described in NZB/W mice . The connection of TNF to cell death is already indicated by its name. Indeed, the pro-apoptotic properties of the cytokine, mediated mainly via TNF-R1 but possibly also via TNF-R2, are well established [51–54]. By virtue of also being able to activate anti-apoptotic pathways, and NF-κB in particular, however, TNF can also inhibit apoptosis by inducing a variety of anti-apoptotic molecules, such as inhibitor of apoptosis, TNF-receptor associated factor, and FLICE-like inhibitory protein [52–57]. Rheumatoid arthritis synovial cells are just one example where TNF appears to use such pathways to block Fas-mediated programmed cell death [58, 59]. In concordance with these findings, induction of a stress response, which acts mostly via the same signal transduction molecules as TNF, inhibits apoptosis . Therefore, while lymphocytes of SLE patients die when stimulated with high concentrations of TNF in vitro and while serum TNF apparently is associated with the increased in vitro lymphocyte apoptosis rate typical of SLE , the in vivo role of TNF in this respect is not clear. In fact, the observation of decreased apoptosis rates upon addition of autologous plasma  rather suggests that the propensity to undergo apoptosis in vitro may be due to cytokine withdrawal afflicting in vivo activated cells . Theoretically, an abrupt fall in bioactive TNF, as induced by therapeutic TNF blockade, could thus lead to increased Fas-mediated apoptosis. The subsequent exposure of the immune system to more apoptotic material might then be involved in inducing the aforementioned occurrence of antibodies to nuclear antigens during TNF-blocking therapy [6, 7]. However, the notion that TNF can counteract Fas may also be important in another regard. Given that in several mouse strains mutations of Fas (lpr) or FasL (gld) cause severe lupus-like disease by preventing FasL-induced apoptosis [62, 63], protection against Fas-induced apoptosis by TNF may foster autoimmunity. Along these lines, TNF is indeed necessary for sustaining the gld phenotype . We have so far concentrated on aspects of TNF in the afferent limb of the immune response (Fig. 1, upper part), which suggest that TNF may promote a derangement of immune regulation and be one factor potentially responsible for autoantibody induction. However, TNF is the most important proinflammatory cytokine and a harbinger of tissue destruction. In fact, in contrast to the complex role of TNF in apoptosis and in immune regulation, its powerful proinflammatory effects are unequivocal and have been numerously reviewed . In the afferent limb of the (auto)immune response, tumor necrosis factor (TNF) acts as a growth factor for B cells and may promote dendritic cell (DC) maturation, but leads to T-cell hyporesponsiveness and to the expression of anti-apoptotic molecules. Its inhibition by TNF-blocking agents here could influence the immune response in several ways. First, by better activation of T cells, including help for B cells and influences in the T helper type 1/T helper type 2 cell balance (via IL-6). Second, by reduced TNF effects (but increased IFN-α effects) on DCs, and thus a divergence in DC maturation and activation steps. Finally, by effects of B-cell activation via interference with B-cell proliferation and (IL-6-mediated) class switching. All these changes could modulate autoimmunity, particularly when paralleled by effects on apoptosis (induction or inhibition). In the efferent limb, TNF is induced by immune complexes (IC), and promotes inflammation and secondary tissue destruction; liberation of autoantigens during necrosis could fuel autoimmunity. TNF blockade therefore rapidly reduces TNF-induced inflammation, but may also block immunomodulatory and anti-apoptotic activities of TNF. Taken together, TNF blockade can interfere in a beneficial way with tissue destruction, but in the afferent limb it may in part foster autoimmunity. Ag, antigen; Ab, antibodies; M0, monocytes/macrophages; T, T cells; B, B cells. In this regard, murine and human data on systemic lupus arrive at the same conclusions. First, MRL/lpr mice have high TNF in their serum as well as in their nephritic kidneys, and both serum and renal TNF are correlated with disease activity [66–68]. Also, anti-TNF therapy in MRL/lpr mice [69, 70], in motheaten mice  and in C3H.SW mice  is beneficial. Moreover, even in NZB/W mice, TNF application only delays and does not prevent death from lupus . Finally, even NZB/W kidneys contain remarkably high amounts of TNF once glomerulonephritis is established, and low dosages of TNF administered in late NZB/W disease accelerate renal damage [73, 74]. All these data suggest that TNF is pivotally involved in the tissue destruction observed in lupus organ disease. These conclusions are further supported by observations that macrophages are induced to produce high levels of TNF by immune complexes . Since murine lupus like human SLE constitutes an immune complex-mediated disease and since large amounts of immune complexes are deposited in the glomeruli, it is highly unlikely that the TNF expressed in renal tissue confers protective effects. It rather portends what TNF expression in different tissues is usually for: inflammation and consecutive tissue injury. As in experimental lupus, TNF is highly expressed in glomeruli in all forms of lupus nephritis [76–79], and the degree of TNF expression correlates with renal inflammatory activity , as measured by a histological activity index. This correlation again suggests involvement of TNF in the inflammatory and destructive process of the disease. These data are further supported by the finding that infliximab significantly reduced proteinuria, one of the hallmarks of active lupus nephritis, in two patients treated with this TNF blocker for a short period of time . However, longer term follow up and careful observation of potential adverse events (which were not seen hitherto) are mandatory. All these data together indicate that TNF plays a detrimental proinflammatory role in SLE organ involvement (Fig. 1, lower part). Understanding how the immune system integrates the pleiotropic properties of TNF is a challenge, particularly so in diseases like SLE. TNF is both a proinflammatory cytokine and an immunoregulatory cytokine. TNF has differential effects on B cells, on T cells and on dendritic cells as well as on the process of programmed cell death. These complex properties may explain why TNF blockade can induce increases in antinuclear antibodies and at the same time rapidly reduce inflammation and prevent inflammation-induced damage, also observed in SLE patients. These properties also explain why TNF deficiency may foster systemic autoimmunity under some circumstances, as seen in the NZB/W mice, but why lupus autoantibodies also occur in mice with increased TNF . TNF is therefore a cytokine with two roles in SLE: its capacity as a prime immune regulator, and its capacity as a proinflammatory mediator. In the afferent limb of the immunoinflammatory response, with its role in lymphoid organ structure development and cellular interactions therein, as well as its influence on B cells, on T cells and on dendritic cells, TNF can modulate an autoimmune response; blocking TNF therefore may or may not be wise (Fig. 1). In the efferent limb of the response, TNF clearly induces inflammation and local injury. With respect to the local injury, blocking TNF should be highly beneficial (Fig. 1). A critical view on all of these aspects will be necessary to further increase our understanding of the role of TNF in SLE. In the end, however, it is clinical trials that will put all hypotheses to their most relevant tests. JS is an occasional consultant for Centocor.